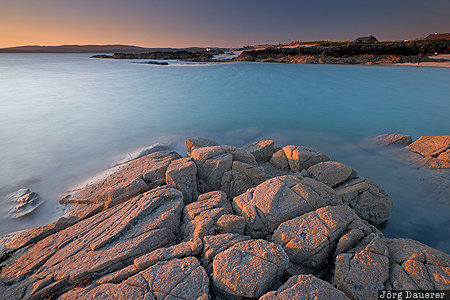 Rocks at the beach of Mannin Bay near Derrygimla illuminated by warm evening light with the water of the Atlantic Ocean looking smooth by choosing a long exposure time. Derrygimla is in Connemara, County Galway in the west of the Republic of Ireland. This photo was taken in the evening of a sunny day in May of 2016. This photo was taken with a digital camera.